Tina and Joe Drakulich are still haunted by the mural their son David painted during leave before returning to war. David’s painting of a sunset-glowing mountainside city rising amid a meadow filled with black crosses conveyed a stark premonition that he would not be coming home from his third combat deployment. The 22-year-old paratrooper died in January 2008 on an Army patrol in Afghanistan. His parents were devastated—not only by grief, but also by an unexpected tsunami of post-traumatic stress that can sweep through survivors in military families. After relentless anguish that severely affected their jobs and life at home on a mountain range outside Reno, Nevada, the Drakulichs created an arts foundation in honor of their son and began networking with other Gold Star families, Blue Star families, artists and veterans. Their networking on behalf of their vision of art helping to heal war wounds led to co-hosting a series of Combat Paper workshops, culminating in a weekend gathering at the Nevada National Guard headquarters in Carson City last month. This event led to a memorable diversion from a vacation trip to California, when I was invited to participate in the workshop and read from the latest collection of my poetry, Life After War & Other Poems, published by Combat Paper Press. While there, I talked about developments at the Combat Paper program in New Jersey, hosted by the Printmaking Center of NJ and expanding to workshops at colleges and art institutions. 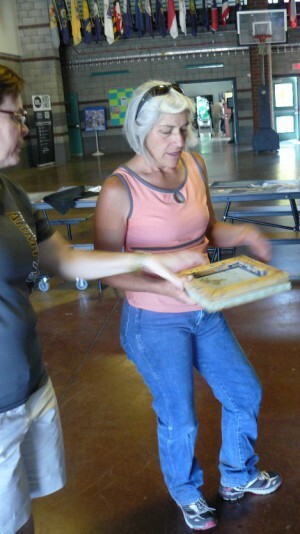 As several veterans and military family members cut up old uniforms and created hand-made paper on which to imprint an astonishing variety of artwork, I learned about an impressively wide-scale collaboration by Nevada arts groups, state agencies and state colleges in providing arts and writing workshops for veterans and military families in various locales in the Sagebrush State. Tina Drakulich teaches art therapy classes at the Veterans Affairs hospital in Reno. Jill Berryman, president of the Nevada Alliance for Arts Education, learned of the Combat Paper Project at a conference in San Francisco. With a son who served in Iraq and another son in the Air Force, she invited Combat Paper founder Drew Cameron, who had recently moved to San Francisco, to meet Tina and do workshops in Nevada. The two women liked the initial workshops in Reno so much they convinced others to help sponsor a bigger event this summer in the state capitol at the National Guard headquarters. One young veteran showed up with several uniforms donated by battle buddies. A Vietnam veteran came with his wife, but found it too emotionally unsettling to go inside the room where the workshop was held. His wife returned the day of my poetry reading with a copy of Winning Hearts & Minds: War Poems by Vietnam Veterans, which I’d helped compile and co-edit in 1972. There was a further serendipitous connection, we discovered: the upset vet served in Vietnam with a friend of mine. Luana Ritch showed up with her 1970s-era Women’s Army Corps field jacket, which held a lot of unsettling memories. She wasn’t sure whether to put the old WAC uniform in a museum or cut it up and turn it into an artistic statement. Among these memories was serving in South Korea in 1980 in her summer-weight uniform and being denied winter gear by a supply clerk. “You are non-essential personnel!” the young woman was told by a fellow soldier at a base within battle distance of the heavily armed DMZ border with North Korea, she recalled. Ritch, a retired Army Reserve staff sergeant, arrived at the Combat Paper workshop via writing workshops sponsored by the Nevada Office of Veterans Services and taught by professors at state colleges. She attended the writing workshops, she said as she sloshed paper pulp made from sliced up pieces of her old field jacket, because a PTSD counselor at the VA suggested writing poetry as a creative method of therapy. In her day job, Ritch is head of the state Health Statistics bureau, which recently issued a stunning report on skyrocketing rates of suicide among young male and female veterans in Nevada. She knows a great deal about grief. Now she was looking to learn more about healing. As she weighed what to put on the paper she was crafting, Ritch examined a variety of art pieces that Tina Drakulich had created on paper made with one of her son’s Army uniforms. 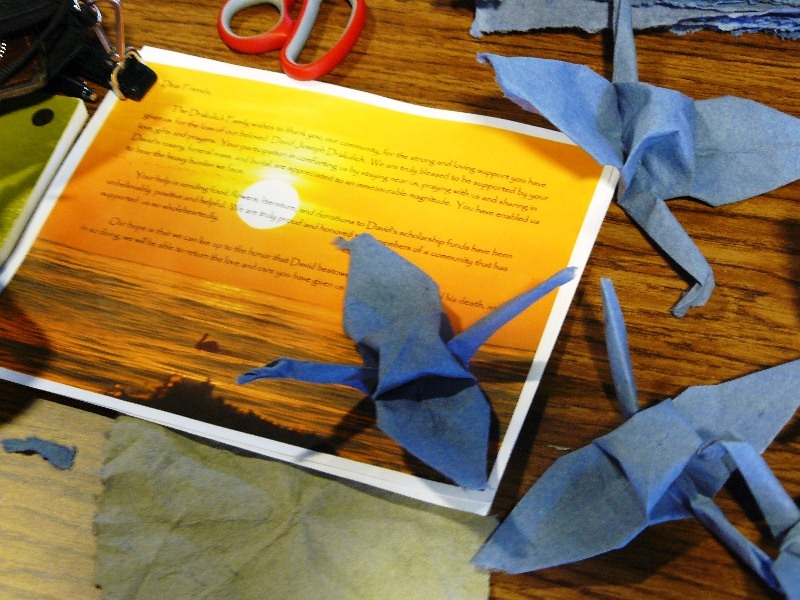 These included a photo of David in uniform printed on sheets of Combat Paper, a swirling abstract art piece that encapsulated a tuft of hair from a family horse that died recently, and paper cranes made of carefully folded squares of Combat Paper. Her plan is to create a mobile installation with one thousand paper cranes as a contemplative war memorial. Joe Drakulich is a native Nevadan who trains horses, flies his own airplane and drives long-haul delivery trucks. He also sings opera and loves art. He’s still trying to figure out how to heal after his son died in Afghanistan. He liked the creative process of Combat Paper. Tina Drakulich juggles her work as an elementary school teacher with directing the David J. Drakulich Art Foundation. As the small group of veterans and military family members sliced up uniforms on tables set out on a basketball court, put small pieces through a portable beater that creates a watery pulp and strained pulp through screens to create sheets of paper in various military hues, National Guardsmen and women on weekend duty stopped by to see what was going on. Some asked if they could participate in future workshops. The Drakulichs’ goal, working with Jill Berryman and others, is to create a Combat Papermaking workspace and conduct on-going art workshops in Nevada.